I am seeking help in managing a young patient 14 years old male with pathological subtrochanteric fracture neck femur. the problem is the severe varus deformity of the proximal femur the so called shepherd's crook deformity and also healing fracture shaft femur in midshaft region which he had sustained 6 months ago and was treated conservatively elsewhere. 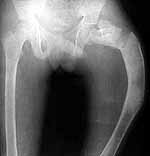 patient wants his deformity correction along with his fracture treatment if possible. Is interlocking nailing an option here ? Any advice, tips or personal experience welcome. According to a report by Freeman et al JBJS 69A 691, it appears that good results can be obtained from multiple osteotomies combined with Zickle Nailing. The lateral starting point of the Zickle Nail may be better suited for IM nailing of the skeletally immature patient at risk for femoral head AVN as has been alluded to in a previous OTA list discussion on IM nailing of pediatric femur fractures. thanks for your response. Yours was the only one on this list but it was enough. I did not have Zickel nail so planned for Gamma. Had to open the fracture site as could not reduce it closed. Also did a wedge osteotomy in mid shaft level to correct the deformity. The wide canal diameter allowed me to pass the straight nail down the canal. The thigh is now straight, leg length almost equal ( affected leg is probably 1/2 cm longer !) and no neurovascular deficit. The patient is delighted and working hard on knee flexion and has acheived up to 90 degrees now. Histopathology has come back as fibrous dysplasia. I am attaching the pre op and post op xrays. The Xrays look good but clinically patient has gross limp. 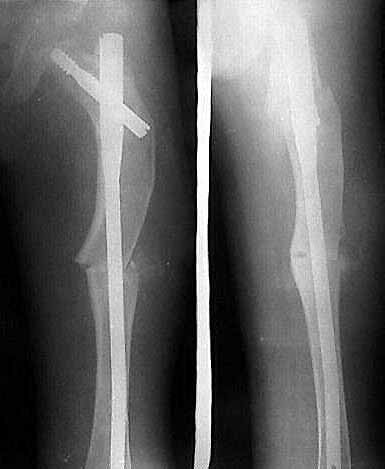 With the straightening of femur the leg lengths are almost equal ( Affected leg is about 1/2 cm longer). But he has about 40 degree of fixed abduction deformity in the affected leg so when he stands the pelvis tilts and he has apparent lengthening of about an inch on the affected leg. This makes him limp. The abduction deformity is probably secondary to contracture of the Gluteal muscles. The question is whether I should release them now or will they stretch out in time. The alignment of the shepherd's crook femur is much improved after osteotomy and nailing. The IM nail was a good choice because fibrous dysplasia bone does not heal well long term in some cases after surgical intervention. I would leave things alone at present even with the abduction contracture and apparent leg length discrepancy with limp. The increased compression on the lateral aspect of the osteotomy may help new bone formation there where the cortex may thin in this disorder (therefore, the shepherd's crook). Perhaps a lift in the opposite shoe? If pressed to release abduction contracture of the hip in an otherwise normal patient, it can be done effectively by taking down the abductor muscle origins from the ilium and reattaching them at a lower level. At the Maine Orthopaedic Review, I have shown the case to Dr. Perry Schoenecker who also favors a "wait-and-see" approach. Freeman et al JBJS 69A 691 (Multiple osteotomies with zickel nail fixation for polyostotic fibrous dysplasia involving the proximal part of the femur) make no mention of abduction contracture releases even though there were similar degrees of proximal femoral deformity preop.